Justin Timberlake Archive - JT HEADLINING THE PEPSI SUPER BOWL LII HALTFIME SHOW! You are here: Home / News / JT HEADLINING THE PEPSI SUPER BOWL LII HALTFIME SHOW! It's official!!! 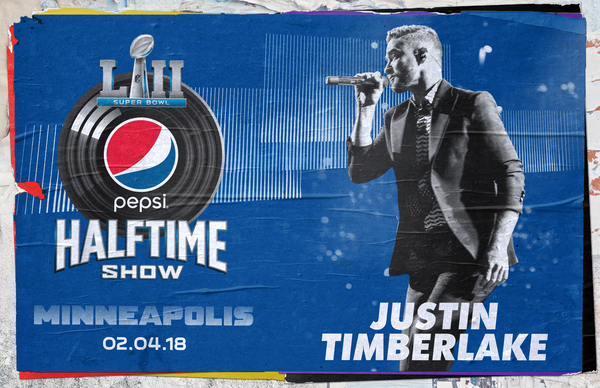 JT will headline the Pepsi Super Bowl LII Halftime Show on Sunday, February 4, 2018 at US Bank Stadium in Minnesota! This will be JT's third time performing on the Super Bowl Halftime stage, giving him the distinction of having the most appearances by an individual entertainer. He previously performed at Super Bowls XXXV and XXXVII. This announcement is just the beginning. Leading up to Super Bowl LII, you may visit Pepsi.com for behind-the-scenes looks into JT's journey to the Pepsi Super Bowl LII Halftime Show, as well as other surprises along the way. Go go ! You're the best Justin ! I hope JT reunites with 'Nsync for his performance! Dengan fasilitas online 24jam non stop dan dengan customer service yang sangat ramah yang juga siap menerima keluhan Anda setiap saat akan membuat Anda semakin nyaman dan betah dalam mengikuti setiap permainan yang tersedia didalamnya.